The Mitsubishi 4G63T is the legendary 2.0-liter turbocharged engine produced from 1987 to 2007 and based on the naturally aspirated version - 4G63 non-turbo. The 4G63 turbo engine is well known for being used in the Mitsubishi Lancer Evolution series of cars up until 2006 when it was replaced by the new 4B11T turbo engine. The engine has a cast iron cylinder block with the height of 229 mm, strong and durable crankshaft, and light 150 mm long forged connecting rods. The engine block was equipped with oil jets for cooling pistons. The compression ration also was lowered. On top of the block, there is a 16-valve aluminum cylinder head with belt driven double overhead camshafts (DOHC head). The intake and exhaust systems were significantly redeveloped. The cylinder head has reworked exhaust and intake ports. The engine received the new intake manifold and throttle body with 60 mm throttle valve. The cast iron exhaust manifold was adapted for turbocharger installation. After turbocharger, the compressed intake air is cooled by the large intercooler. The more air needs more fuel; in this case, there are high-productive fuel injectors 450/390 сс (non-turbo versions had 240/210 cc injectors). These basic changes were made in the first years of production for the Mitsubishi Galant VR-4 and Lancer Evolution I applications. The Mitsubishi produced three generations of the 4G63T, each time making some changes to increase power and efficiency. Let's take a closer look at them. The 4G63T 1G is the first generation engines in the Evolution I, Evolution II and Evolution III from 1987 to 1996. 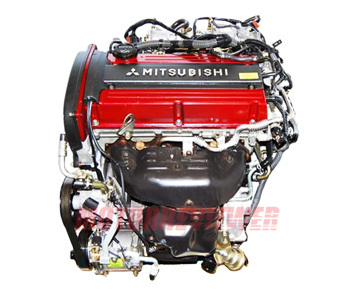 The first 4G63 turbo engine was installed in the Mitsubishi Galant VR-4. It has a 7.8:1 compression ratio and was equipped with the TD05H 14B turbocharger for a manual transmission and TD05H 13G turbocharger for the automatic gearbox. The max boost was 0.6 bar (8.7 psi). This version produced 195 hp at 6,000 rpm and 217 ft-lb (294 Nm) at 3,000 rpm but in 1989 by simple ECU upgrading the max power was raised up to 220 hp. The serious changes were released in 1990 for the Evolution application. The 4G63T got the new injectors, larger intercooler, new light connecting rods and another turbocharger came with manual gearboxes – the TD05 16G (60 mm compressor wheel). The compression was increased to 8.5:1 for Evolution I and II. The power output was raised to 240 hp for Evolution I and 260hp for Evolution II. The max torque is 228 ft-lb (309 Nm) at 3,000 rpm. The Evolution III had raised the compression ratio to 9.0:1 and used an even larger turbocharger than previous models called as Large TD05 16G6 (it has 68 mm compressor wheel). That allowed to increased power to 270 hp at 6,250 rpm (the max torque is the same). The second generation 4G63T G2 engine was installed in the Evolution IV, Evolution V, and Evolution VI. Now the engine was relocated on the right side in the engine bay. Positions of the flywheel and cam drive of the engine have changed compared to previous G1 versions. The G2 engine had a new cylinder head with reshaped exhaust and intake ports, 450 сс fuel injectors, lightweight pistons, and 8.8:1 compression ratio. The intake system also was revised. There are a new intake manifold and throttle body with 52 mm valve. There is a laminated steel gasket between the engine block and cylinder head now. The new TD05HR-16G6-9T turbocharger produces the max boost pressure of 0.9 bar (13 psi). Here are engine specs for Lancer Evo IV - 280 hp at 6,500 rpm and 260 ft-lb (353 Nm) at 3,000 rpm. The engine for the Evo V was tuned up a little bit: new cams, 560cc injectors, ECU remap and etc. The turbocharger was replaced by the twin scroll TD05HR-16G6-10.5T turbocharger. For Evolution VI, the engineers improved engine cooling. The engine specs for Evo V and VI are identical - 280 hp at 6,500 rpm and 275 ft-lb (373 Nm) at 2,750 rpm. The last third generation was introduced for the Lancer Evolution VII in 2001. It produced 272 hp at 6,500 rpm and 253 ft-lb (343 Nm) at 2,750 rpm. This version had new camshafts, a new intake manifold with better airflow, the TD05HR-16G6-9.8T turbocharger. The engine also was equipped with big air-to-air intercooler with water spray nozzles in front of it, and the oil cooler. The 4G63T G3 for the Evo VIII was upgraded again. This engine had a lightweight crankshaft (13.38 kg), new forged steel connecting rods, new exhaust manifold, heavy-duty aluminum pistons (476 g) and revised valvetrain. The power output was improved - 265 hp at 6,500 rpm and 262 ft-lb (355 Nm) at 3,500 rpm. The last model which used the 4G63T engine was the Evolution IX. The 4G63T for Evo IX is the most modern and advanced engine of all 4G63 2.0l turbo engines. The engine was equipped with Mitsubishi’s variable valve timing MIVEC for the intake, two-piece rings, extended reach spark plugs and the TD05HRA-16G6C-10.5T turbocharger. The final version produced 280 hp at 6,500 rpm and 295 ft-lb (400 Nm) at 3,000 rpm. The common problems are the same as the non-turbo engine has. The engine needs extra attention to the oil system. Use only high-quality engine oil and change it regularly. The overrun oil can plug oil channels to the bearings of the balance shafts. The jammed shafts due to damaged bearings will break the timing belt which caused a huge mess of pistons and valves inside combustion chambers. To avoid this, it is better to replace the balance shafts with aftermarket balance shaft eliminator kit. Dirty oil is also bad for hydraulic valve lifters – the weak point of the engine. They usually live about 35,000-40,000 miles. The 4G63T engine had a great reliability for that kind of performance. The engine life of a stock 2.0-liter turbo engine is about 200,000-250,000 miles (300,000-400,000 km). But as you can imagine, it was great for tuning and racing due to its potential, so rare engines stayed untouched until this line.